Uglesich’s Restaurant in New Orleans at the corner of Baronne and Erato streets was legendary. Founded in 1924, Uglesich’s (pronounced yoo-gul-sich) had a loyal and very devoted following for more than eighty years before closing. In 1920, Sam Mate Uglesich came to New Orleans from Yugoslavia and found work in the restaurant business, and in four years saved enough money to open his own seafood and po’boy restaurant. He sold the restaurant to his son and daughter-in-law in the 1960’s. Anthony and Gail Uglesich worked there together since their marriage, and closed the restaurant together. 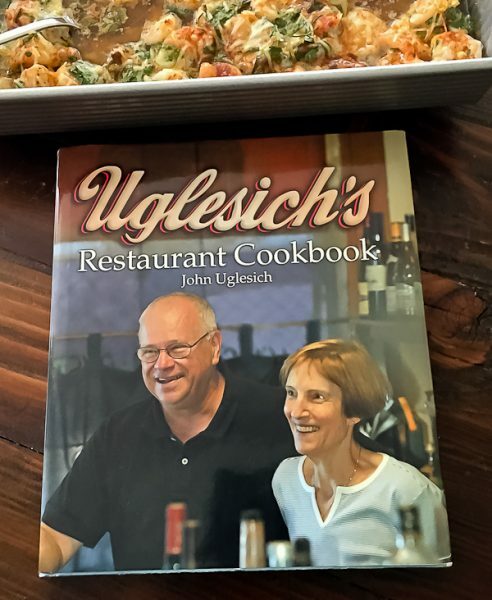 The Uglesich’s worked hard all those years, serving fresh and local ingredients and never skimping. No corners were cut when it came to ingredients. They arose early in the morning to make all the sauces with Gail measuring everything by the teaspoon. It was real home cooking. There was nothing fancy about the restaurant with its ten formica-topped tables sitting on cement floors in a single room. But it was all about the food and the lovely people who made it the legend it was for decades and is sorely missed by many. Of course, with a two-month old baby, Kara was rather busy so she asked me to peel and devein the shrimp and asked Kristina to make it. Kara wanted to serve it with grits, but it can also be served with a nice warm loaf of French bread for dipping into the buttery, garlic sauce. Oh my, it was good. Place the butter, olive oil, lemon juice, and Worcestershire sauce in a pot and cook on low heat for 10 minutes. 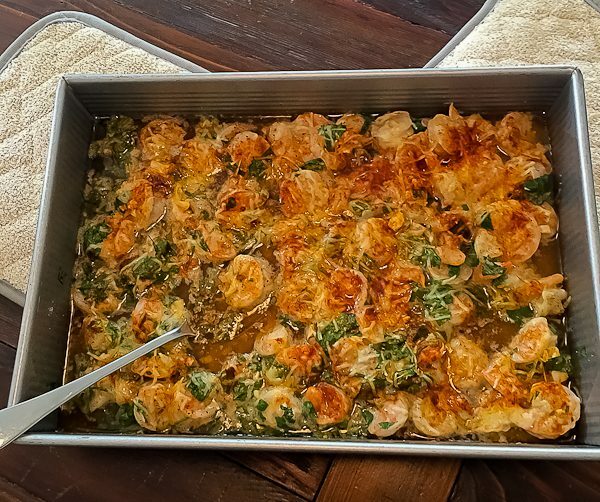 Place the shrimp in a baking dish and pour the sauce over the shrimp. Add the salt and black pepper. Spread the garlic over the shrimp, then sprinkle with parsley, Parmesan, and paprika. Bake for 15 minutes. Serve with grits and/or hot crusty bread. How wonderful to be there for little Vivi’s baptism. That did require a favorite celebration meal! 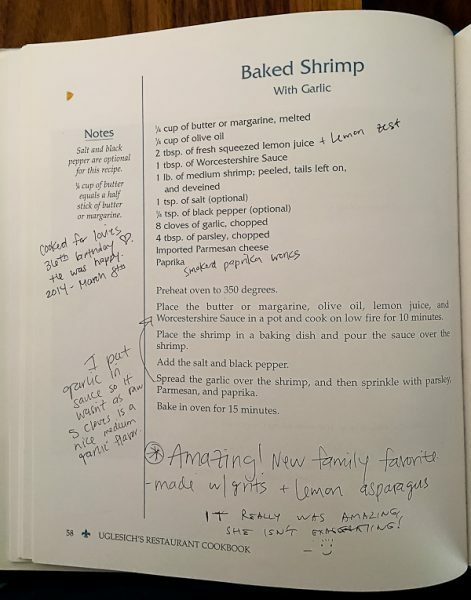 Another very special event for Kara to write on the recipe. Can’t wait to try the garlic shrimp on my family. Looking forward to your grand-baby blog coming up! It was so special and such an important part of her life. I think you will love the shrimp! I want to order the cookbook; it’s a good one. This indeed was delisheous, friends and family were delightful, but Vivi was the star of the show. So glad you posted it. Now in my file to make.